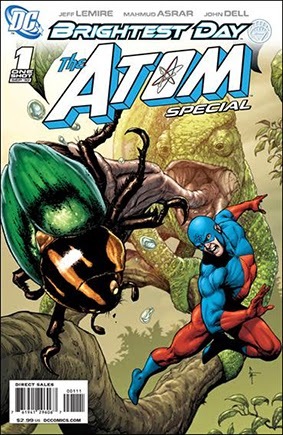 • PLOT SUMMARY: Discover all-new allies, enemies and adventure as The Atom leaps from the pages of BRIGHTEST DAY into this one-shot special! Rising stars Jeff Lemire (SWEET TOOTH) and Mahmud Asrar (Avengers: The Initiative) update the Atom's origin and kick off the tiny titan's next major story, which continues this month in ADVENTURE COMICS #516 (see page 87). If you thought you knew Ray Palmer, then think again! The smallest hero in the DCU is about to become one of its biggest, and the excitement starts right here! Written by JEFF LEMIRE. Art by MAHMUD ASRAR & JOHN DELL. Cover art by Gary Frank.